Downgrade iOS 10.1.1 to 9.3.3 for jailbreak. Accidentally updated to iOS 10.1.1, 10.1, 10.0.2 to 9.3.3? Getting iTunes Error 3194, 100, 1671? Accidentally updated to iOS 10.1.1, 10.1, 10.0.2 or 10 and looking for a possible way to downgrade iOS 10.1.1 / 10.1 to 9.3.3 in order to jailbreak your device? Here are all the answers. Apple has seeded iOS 10 since October this year and til now there were already multiple bug fix releases, iOS 10.1.1 is the latest version to this date. But there is still no news about iOS 10 being jailbroken yet since it was released, not even the last few versions of iOS 9 – iOS 9.3.5 and iOS 9.3.4. The latest jailbreak-able iOS version is still iOS 9.3.3 by Pangu which has already been around for a few months now. 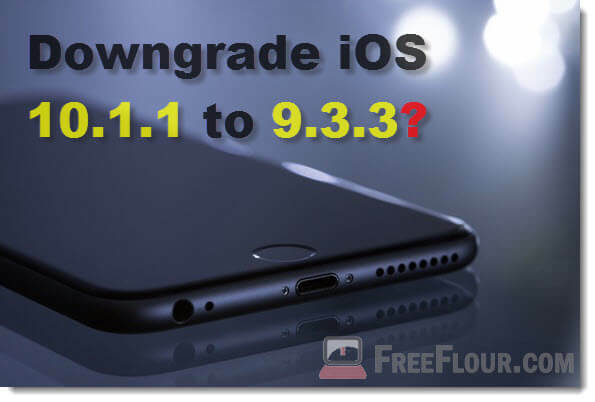 Well, if you are looking to downgrade iOS 10 to 9.3.3 so that you can jailbreak your device again, we’re sorry to say that it isn’t possible to do so. We will explain why below. It’s important that you know why it’s impossible to downgrade to a certain iOS version so that you know what to do next time to preserve a possible jailbreak iOS version, instead of wasting more of your valuable time trying to search for a method that never existed. Apple has this iOS signing protocol that every user will have to go through whenever they update or restore to an iOS version. What it means is that whenever you try to restore to an iOS version, for example iOS 9.3.3, iTunes will first connect to Apple server to ask for permission to install the said iOS version, Apple will then see if this particular device is still eligible for the said iOS version, if Apple is still signing that particular iOS version, you will be able to restore it, otherwise iTunes will always show you error 3194, 100, 1671, 53, 1, or 7 which I believe you have already familiar with them. In other words, if Apple has stopped signing for an expired iOS version, it’s no longer possible to downgrade to it anymore. Apple will usually stop signing for an older iOS version around 2 weeks after the release of latest iOS version. In our case now, Apple has already stopped signing for iOS 9.3.3 months ago, making it impossible to downgrade to it anymore. However, for iOS 9.3.5, only those older devices that are not supported in iOS 10 will still be able to restore to it. Any iOS 10 supported device will not be able to downgrade to iOS 9.3.5 anymore. (iOS 10 supports iPhone 7, 6s, 6, 6s and 6 Plus, iPhone 5s, 5c, 5, iPhone SE, iPad air 1, 2, iPad Pro, iPad mini 2, 3, 4, iPad models above 3rd generation, and iPod Touch 6th generation). Since iOS 10.1.1 is now the latest iOS version release, the only iOS versions you can still be able to downgrade (restore) to are iOS 10.1, 10.0.2 and 10. There is really no reason to downgrade to any of these older iOS 10 versions if it’s not for jailbreak purposes. But, if you encounter sudden and obvious battery degrading or performance issue right after an update, you may want to try downgrading to any of these earlier iOS 10 versions. You can also choose to stay with certain iOS, for example iOS 10.0.2, to preserve a future jailbreak release. There were a lot of cases where an older iOS version jailbreak was released but Apple had already stopped signing for that particular iOS. It’s kind of a gamble though but it’s still worth to stay with an iOS version if you’ve heard a lot of rumors about it being jailbroken by some prominent developers already. What can you do now to jailbreak your iPhone or iPad? Well, if you have already installed the latest iOS 10.1.1, there is nothing else you can do to get a jailbreak other than waiting for the actual public jailbreak for iOS 10.1.1 to release, which we believe will be many months away. You can, however, downgrade to iOS 10.1, 10.0.2 or 10.0.1 if you want to preserve it just in case when Apple stops signing for them. If you are with iOS 9.3.3, you can jailbreak your device now with Pangu jailbreak tool and most importantly, stay away from any update until there is new jailbreak release for any newer iOS version. If you are with other older iOS versions, you might as well just update to the latest iOS since there is no way you can restore your iPhone to iOS 9.3.3 anymore. Just enjoy the new iOS 10 features while waiting for a jailbreak of it to release. Whether it’s due to sudden battery degrades or performance issue (especially for an older but still supported iPhone or iPad) or that you just want to preserve 10.1 or 10.0.2 for a future jailbreak, if you insist to downgrade iOS 10.1.1 to 10.1 or 10.0.2, here’s how. Before you begin with the steps below, make sure you have fully backup all your important data, photos, videos and everything else you care about by either creating a full backup copy using iTunes or by syncing it into your PC or iCloud. Download and install the latest version of iTunes if you haven’t already done so. Download link can be found from apple.com/itunes for Windows 10/8.1/8/7 or Mac. Download iOS 10.1 / 10.0.2 / 10.0.1 IPSW file that matches your iOS device model and save it to your desktop or whichever location you can remember. Turn off Find my iPhone by going to Settings > iCloud > Find My iPhone on your device. Connect your iPhone or iPad to your Windows PC or Mac. Put your device into DFU mode (Device Firmware Update mode is a state where your phone does not load the OS but can interfere with iTunes for firmware installation). For non iPhone 7 users, hold down both the Power and Home buttons on your iPhone for 10 seconds, and then release the Power button but keep holding Home button until it enters DFU mode. iTunes will alert you when it’s successfully entered DFU mode. On your computer, launch iTunes. Click on your device on the left panel, hold Shift + left click on the Restore button (Alt + click for Mac). Browse to the IPSW file you have downloaded earlier. Once selected, the downgrade process will begin. Sit back and wait for couple of minutes for the process to finish. Your device will restart several time during the process. When it’s done, you will be greeted with a welcome screen. Important Update: Apple has officially stopped signing for 10.0.2, 10.0.3, and 10.0.1. It’s now no longer possible to downgrade to these versions. However, you can still downgrade to 10.1 if you are now with 10.1.1 while Apple is still signing for it.